The Trans-Atlantic Slavery Database project is a consortium of worldwide scholars and institutions. It allows students to research and survey broad patterns in the development of Atlantic slavery as well as individual data on slave ship purchases and movements. This project is the result of several generations of scholarship on the history of Atlantic Slavery, including the important work by Philip Curtin and David Brion Davis. Daniel Eltis who co-edits this project is the author of The Rise of African Slavery in the Americas (Cambridge University Press, 1999). In this course, we'll have a computer lab workshop that allows us to explore the use of this database project and how we may learn from it. 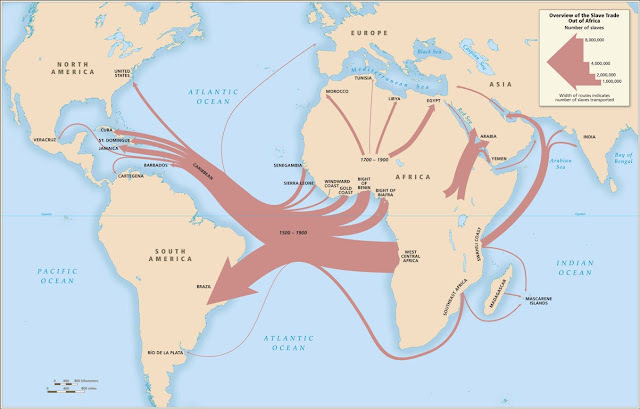 The database contains the detailed transactional information on 35,000 slave voyages across the Atlantic from the 16th to the 19th centuries. For example you may find the voyages of the slave ship, The Amistad, that was the basis for the Stephen Spielberg film of the same name. A good place to begin in this website is the Introductory Maps section. These maps are selections from David Eltis and David Richardson, Atlas of the Transatlantic Slave Trade (Yale, 2010).